As well as thiamin (vit. B1), which contributes to the normal function of the heart, vitamins B6, B12 and folic acid have been included in Cardioace to help maintain normal homocysteine metabolism. Analysis has revealed that high levels of homocysteine are a strong independent factor in heart health, accounting for as much as 10% of the combined influence of all known factors in heart health. Folic acid also contributes to normal red blood formation. Cardioace is available in the UK from larger Boots, Superdrug, Tesco, Waitrose, supermarkets, pharmacies and health food stores. Alternatively you can order online here. Nutritional tablets with vitamins, minerals, Garlic extract, Flaxseed oil and Carotenoids. Maltodextrin, Bulking Agent: Microcrystalline Cellulose, Vitamin C (Ascorbic Acid, Hydroxypropylmethylcellulose), Magnesium Oxide, Flax Seed Oil Powder (Carriers: Maltodextrin, Modified Starch, Antioxidants: Ascorbyl Palmitate, Ascorbic Acid & Mixed Natural Tocopherol), Vitamin E (D-Alpha Tocopheryl Acid Succinate) (from Soya), Anti-Caking Agents: Silicon Dioxide, Stearic Acid & Magnesium Stearate, Tablet Coating: (Hydroxypropylmethylcellulose, Hydroxypropylcellulose, Caprilic/Capric Triglycerides, Natural Source Colours [Titanium Dioxide, Iron Oxides]), Vitamin B12 (Cyanocobalamin [Carriers: Trisodium Citrate, Citric Acid, Maltodextrin]), L-Carnitine Tartrate, Zinc Sulphate, Betacarotene (Carriers: Starch, Water, Antioxidant: DL-Alpha Tocopherol), Garlic Powder, Niacin (as Nicotinamide), Thiamin (Vitamin B1 as Mononitrate), Ferrous Fumarate, Crosslinked Cellulose Gum, Vitamin B6 (as Pyridoxine HCl), Vitamin D3 (Cholecalciferol [Carriers: Acacia, Sucrose, Corn Starch, Medium Chain Triglycerides, Antioxidant: DL-Alpha Tocopherol]), Manganese Sulphate, Co-Enzyme Q10, Copper Sulphate, Riboflavin, Chromium Trichloride, Folic Acid (as Pteroylmonoglutamic Acid), Sodium Selenate, Potassium Iodide. Allergy Advice: For allergens, see ingredients in bold. ONE TABLET PER DAY WITH YOUR MAIN MEAL. Swallow with water or a cold drink. Not to be chewed. Do not exceed the recommended intake. Only to be taken on a full stomach. A regular intake is recommended. This comprehensive formula replaces other Cardioace supplements and multivitamins. There is no need to take an additional multivitamin. As with other food supplements, consult your doctor or pharmacist before using if you are under medical supervision, taking cholesterol lowering medication, have epilepsy, a thyroid condition, haemochromatosis, suffer from food allergies, or are allergic to any of the ingredients. Allergy Advice:For allergens, see ingredients in bold. Made in a site that may handle nuts. This product contains iron, which if taken in excess, may be harmful to very young children. Why has Cardioace been developed? Will Cardioace help to reduce cholesterol levels? Can Cardioace be used simultaneously with medications? How many tablets does one pack of Cardioace Original contain? How and when should Cardioace be used? 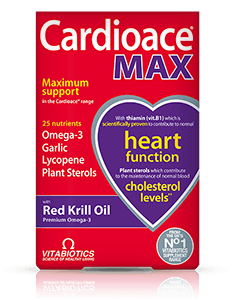 Are there any undesired effects whilst taking Cardioace? 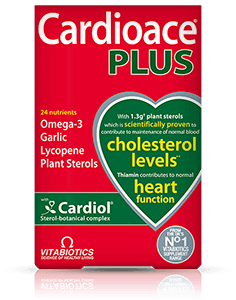 Is Cardioace suitable for Vegetarians? 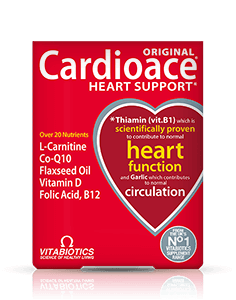 Is Cardioace recommended with any other Vitabiotics product(s)? Generally, Cardioace may be used alongside medications because it contains only moderate levels of vitamins and minerals, and is free from any drugs and hormones; however for specific advice on taking Cardioace with prescribed medication, we recommend you contact your doctor or pharmacist first. "cardioace has completely changed my health pattern within six months of taking one capsule per day." "My wife has been using these capsules for the last 6 years and found them highly beneficial for heart health ." "Your supplement has a really good effect on my lifestyle! I feel so much more energetic.... keep up the good work!" Always read the product directions before use. Do not exceed the recommended intake. As with other food supplements seek professional advice before using if you are pregnant, breastfeeding or suffer from food allergies, and consult your doctor or pharmacist if you have an underlying medical condition or if on medication. Vitamin supplements are not intended to treat or prevent any disease. Food supplements must not replace a balanced and varied diet, and a healthy lifestyle. Do not take if you are allergic to soya.